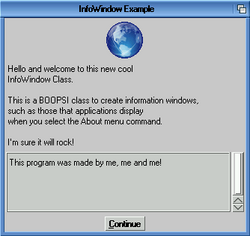 This guide describes the ReAction-compatible information window class for users and developers. 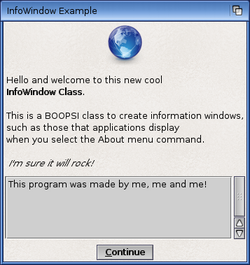 The InfoWindow Class (installed as infowindow.class in the SYS:Classes/ directory) is a BOOPSI-compliant class that is used to display information windows such as About-windows commonly found in many applications. From developers' perspective, it provides an easy and adaptable way of creating and presenting information windows within their application. The class is highly configurable to suit many different needs and scenarios. The latest version is 53.8 available in the Enhancer Software for both AmigaOS3 and AmigaOS4. Configurable button row supporting any number of buttons, and a timeout feature. applications display when you select the "About" menu command. a more sophisticated version of the REQTYPE_INFO requester type. Cancels the infowindow (IWM_OPEN returns IWMRES_CANCEL). the number of the button). Switches between tabs (if the tab panel is displayed). its attributes can only be set or retrieved when the window is NOT open. to change the look, contents or behaviour of the window. SetAttrs() will return the number of attributes set. you don't turn the infowindow into something it's not supposed to be. respectively. This behaviour is inherited from the Window Class. that opening on the default public screen is requested. You might prefer setting INFOWINDOW_Parent over the Intuition screen tags. is especially useful if your application supports jumping between screens. whenever the application changes screen. information window. Often the parent is the application's main window. blocking its input while the infowindow is open. Text for the body of the information window. Example string: "The following words \33bare in bold\33n." bar character (|) if you want more than one button (e.g. "Yes|No"). information displayed in the window before closing it and proceeding. via the INFOWINDOW_Checked tag; see below. 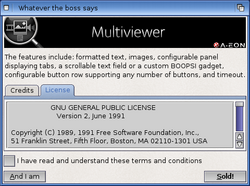 The placement of the optional checkbox gadget within the infowindow. text will show on the left). state of the gadget upon closing the window. pressed, the infowindow will close as if this button has been selected. keyboard shortcut will not be available. This tag takes precedence over INFOWINDOW_ImageFile (see below). stored internally and the class will dispose of it automatically. This tag will be ignored if INFOWINDOW_Image is provided (see above). image in the top-left corner above the body text). This tag will be ignored if there is no body text. Sometimes it may be desirable to place the image on a filled background. This tag allows providing a backfill hook for this purpose. scrollable text fields but other configurations are also possible. Note that the array must be properly terminated as shown. anything about the formatting of the text. This page was last modified on 3 July 2018, at 12:37.